Every morning after I’ve dug over an area of garden then raked it until it looks good I notice that it’s been dug a little more during the night, and not so neatly. We have a lot of foxes in our area and I’ve always known they take a shortcut through the back edge of our garden which has never bothered me but now they’re obviously hanging around in the garden and causing a bit of chaos which worries me a bit for next year when I have veg seeds or seedlings in nicely prepared beds. There are three areas the foxes get in and I can access two of those to close off the gaps then hopefully if there is no through route they won’t bother coming in.. although maybe that’s just being a bit optimistic. Does anyone else have this issue? How do you deal with it? I’ve been off work ill for the past couple of days and have spent most of my time in bed watching videos of Sean’s Allotment Garden which just makes me want to get out there and grow! The only things that are still going in my containers are some peas and four turnip seedlings planted a couple of weeks ago which I’ve covered with old plastic cups to give them a chance of surviving the slugs. I have seen few toads in our garden but clearly not enough to keep our masses of slugs under control. In the border there are still sweetcorn plants which I’m not very hopeful for, we’ve had such a bad summer that I can’t imagined the cobs will be very good but I like the look of the plants so I’ll leave them be for now. 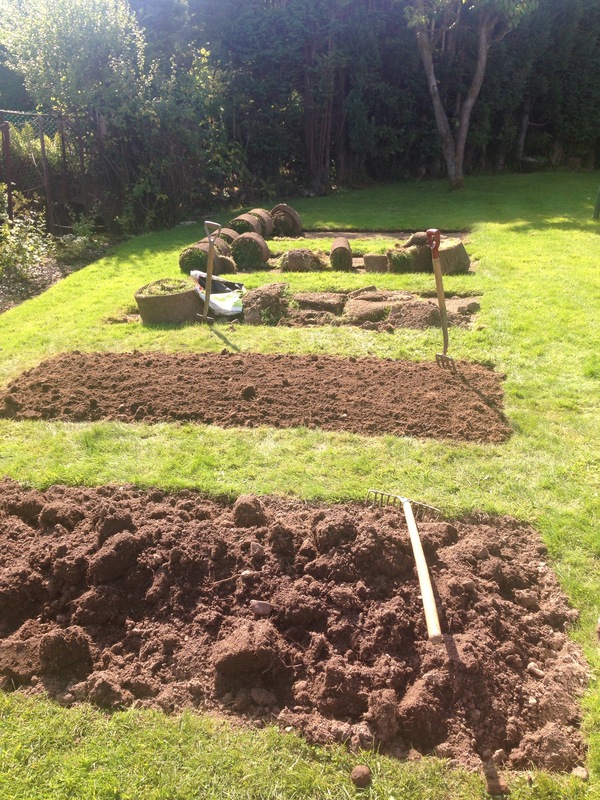 For the veg patch I’ve ordered some garlic, elephant garlic and onions for autumn planting. Only trouble is the onions come as 75 sets so I’ll be giving some away to anyone who will take them as I really don’t have the space or need for 75 onions. I also ordered some ‘Patchwork mixture’ heuchera as plug plants, I went to Tatton Flower Show earlier in the year and the floral marquee was full of heuchera for sale but I was on a budget and resisted so when I saw plug plants I just had to go for it. 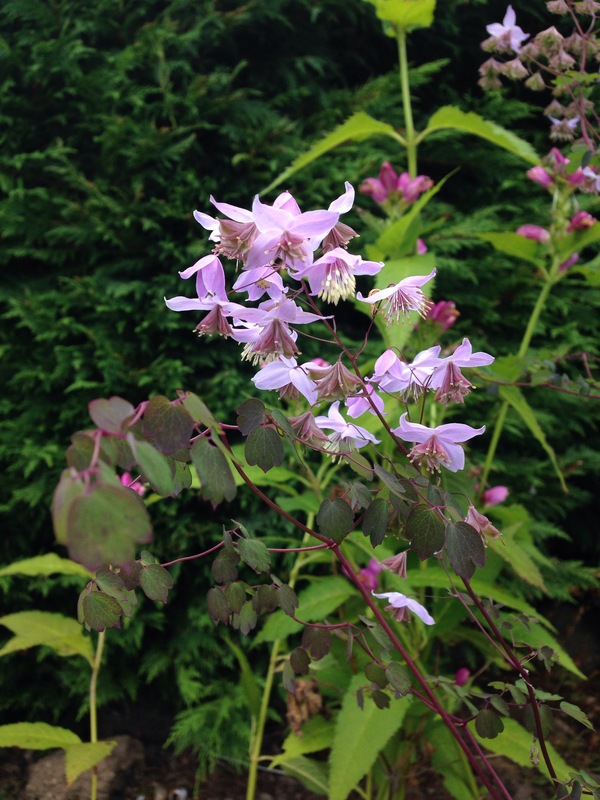 I did however buy a couple of Thalictrum plants at Tatton which I’ve finally planted out into the garden, one white and one purple. 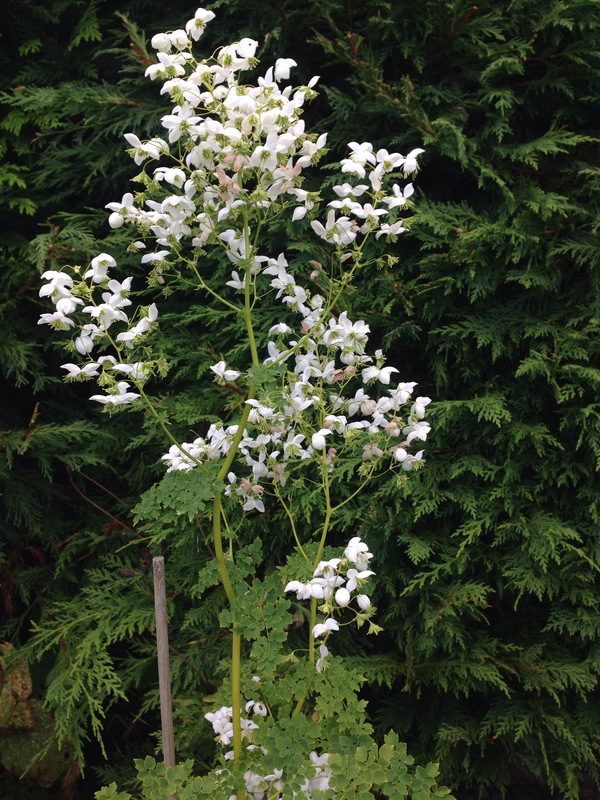 I just love the delicate fern like foliage. My current task is to research some green manure for the empty beds then once myself and the weather are feeling a bit better I’ll get cracking on with the three remaining veg beds. 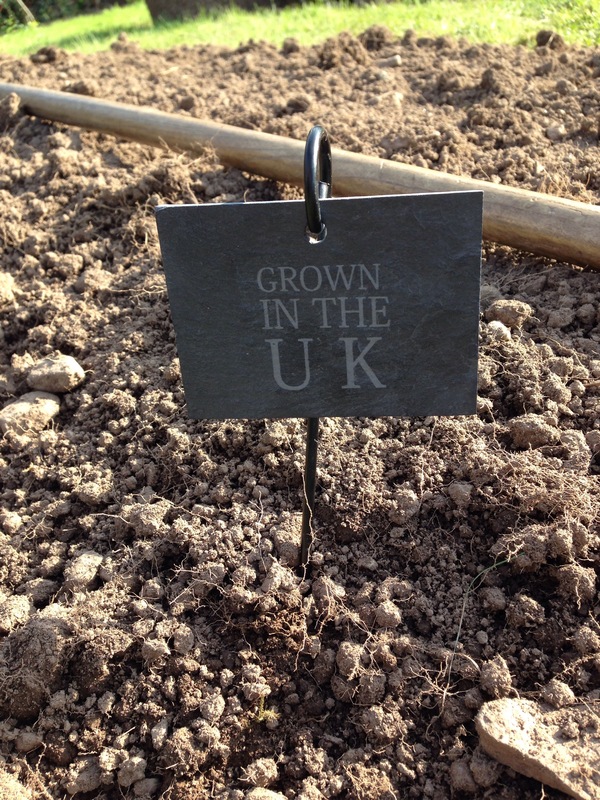 I noticed some slate labels on crooks reduced in Sainsburys to £2.10 a pair, but printed on the labels was ‘Grown in the UK’ and I was really after blank slate labels for my veg beds but I figured it’d be cheaper to buy them and just write over the pre printed text than buying blank labels elsewhere. When I got to the till they scanned through at 70p so I’m quite chuffed with that. 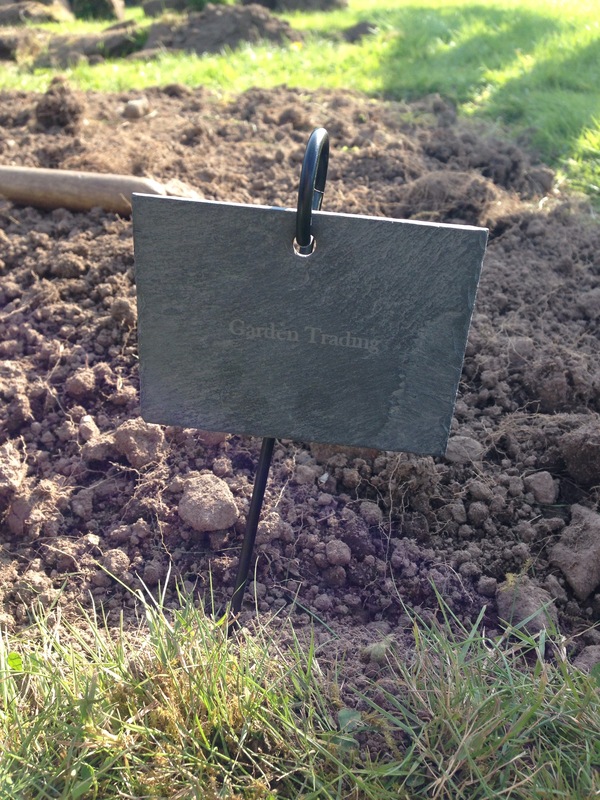 The reverse side of the slate has ‘Garden Trading’ printed on which will probably be better for writing over. Not much has progressed in the garden as we’re also doing up the house so due the rubbish weather I’ve mainly been working inside. My husband bought me a Bee Balm plant which I’ve planted into the new flower bed, I’m still harvesting peas and when the weather allows I’m getting some digging done in the veg beds – two down, three to go. 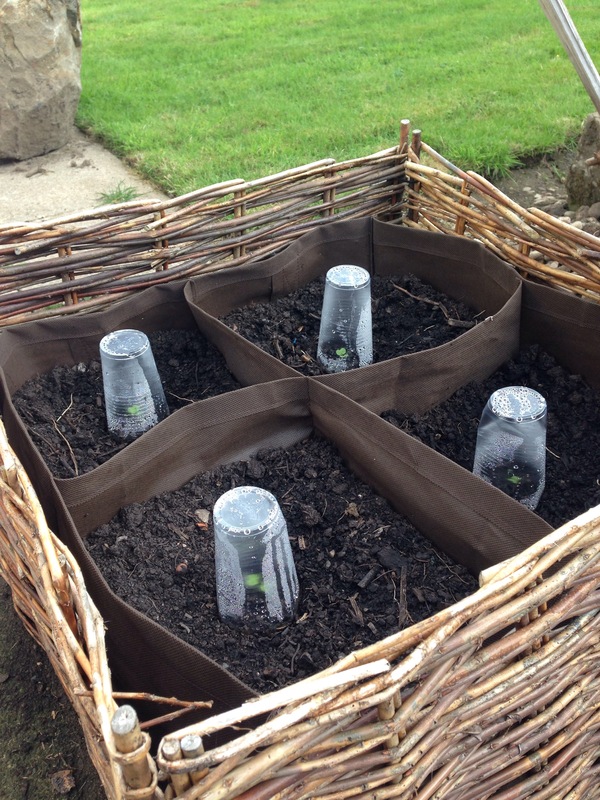 I also saw on Gardeners World that Monty Don was sowing some turnips so I may sow a few today and see how they get on.